New Delhi: Ahead of 2019 elections, the war of allegations among the political parties is heating up everyday. Political heavyweights have already increased the frequency of leveling allegations against each other, while among the surfaces allegations most of them are baseless claims. Every political party is trying their level best to defame each other in a hope that it will make thier political land more fertile. Months long tussle of Aam Aadmi Party and Bharatiya Janata Party doesn’t seem coming to end in near future. 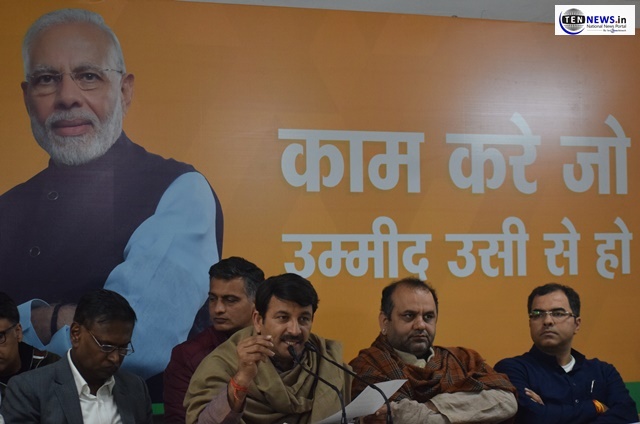 Today at BJP state headquarter in Delhi, BJP MP Manoj Tiwari accompanied by several other MPs including Mahesh Giri and Udit Raj slammed Aam Aadmi Party in a press conference on Delhi CM Kejriwal misleading citizen of Delhi regarding deletion of votes. Tiwari said that the Kejriwal’s party has called Delhiites and told them that their votes has been eliminated from the voters list by BJP, we will fight for the re-inclusion of your name to the voters list if you promise to vote for AAP. The matter was informed to Election Commission by the BJP. Tiwari said that every party helps voters for the inclusion of new voters to the voters list but can’t cut-off thier names. “AAP is misleading the people of Delhi and will the result of thier shamefull act in upcoming Lok Sabha elections”, Tiwari added. In several political rally’s Kejriwal also balmed BJP for the writing off the name of voters.